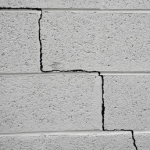 How solid is budget’s foundation? With the Legislature getting ready to pass a budget for the fiscal year starting April 1, some fresh data and analysis emerging from the world outside Albany in the past week or so has raised new questions about the durability of the state’s revenue base. Heading into negotiations, the Assembly and Senate majority fiscal staffs had forecast a lot more personal income tax (PIT) revenue than the governor, who refused to reach a consensus closer to their figure. Yet Cuomo’s revenue outlook (even post-“heart attack”) isn’t exactly pessimistic: he expects PIT payments to bounce back strongly in fiscal 2020, and to increase at a healthy pace of 5.2 percent a year thereafter. The numbers don’t seem consistent with the governor’s high-volume (and well-founded) warnings about the likely corrosive impact of the new federal tax provision capping for state and local tax deductions. a bond market yield-curve inversion, historically seen as an early-warning signal of a recession recession signal (although opinions differ on what it means now). DiNapoli said securities industry profits in 2018 were 11 percent higher than the previous year—not bad, considering the big stock index decline in the fourth quarter. However, the average bonus paid to Wall Street employees in New York City declined by almost 17 percent, to an average of $153,700. The decrease was the biggest since 2011. Those numbers are closely watched because Wall Street represents an outsized 18 percent share of state tax collections. Both the bonus pool and securities firm profits have a history of sharp ups and downs, and neither has ever quite recovered to pre-financial crisis peak levels. Securities industry employment in New York City grew by 4,700 in 2018 but also remains below its 2007 peak, DiNapoli noted. All of this was pretty much in line with the expectations in Cuomo’s financial plan, with no pleasant upside surprises. Still: the top partners in Wall Street major investment banks and hedge funds are the core of New York’s highest-earning 1 percent of New York residents, who generate more than 40 percent of state income tax receipts. The volatility in financial markets, which inevitably affects their profits and compensation as well as public pension fund returns, is a continuing caution sign for state finances. 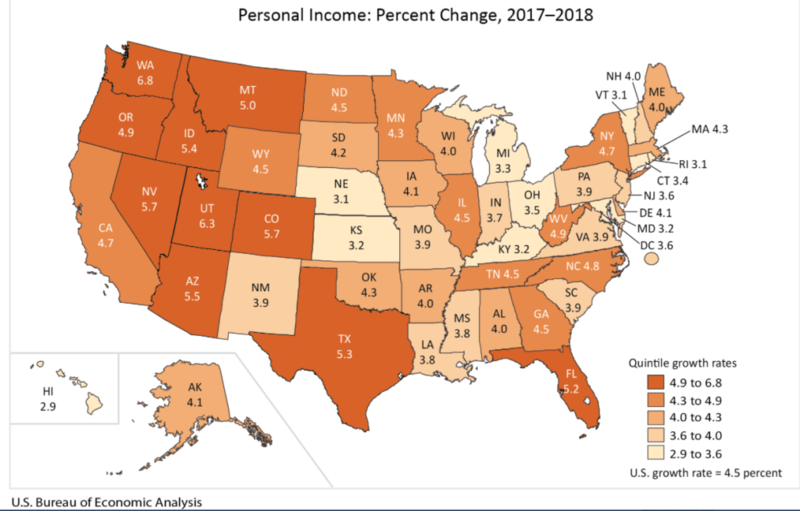 On Tuesday, the federal Bureau of Economic Analysis (BEA) issued its annual preliminary estimate of personal income growth in the 50 states and District of Columbia. On the surface, New York’s number was comparatively decent— 4.7 percent vs. an all-US growth rate of 4.4 percent, enough to rank 13th out of 50 states. But the components of that growth painted a more mixed picture of New York’s relative economic performance. In New York, earnings of state and local government employees rose 10 percent last year, four times the national average and more than double the level of any other state (ranking a distant second by this measure was Utah, which has a young and fast-growing population and a booming private economy). State and local government earnings accounted for fully one-fifth of New York’s personal income growth, also by far the largest state and local government share of any state’s personal income increase last year. Excluding government, private non-farm earnings in New York increased 3.88 percent, a full percentage point below the national average of 4.89 percent. New York ranked just 34th out of 50 states in this category, well behind its populous peers: Texas (+6.22), Florida (+5.96 percent) and California (+5.65 percent). Neighboring Massachusetts and Pennsylvania were closer to the national average, while New Jersey, Vermont and Connecticut all saw even lower private earnings growth than New York. Within the private earnings category, financial sector income in New York was down slightly, consistent with DiNapoli’s Wall Street bonus report. In addition, the downward spiral of New York’s manufacturing sector continued: earnings in the sector were up just 1.5 percent, ranking 45th out of 50 states. Neighboring New Jersey (4.2 percent), Pennsylvania (4.1 percent), Connecticut (3.1 percent) and Vermont (3.2 percent) all had bigger gains in manufacturing earnings, while Massachusetts was among the few ranking below New York (0.7 percent). Bottom line: the private sector share of personal income in New York got smaller, relative to the U.S. average. Assuming the preliminary numbers hold in BEA re-estimates, that’s not a good omen for the future. New York is among four states—also including California, Connecticut and New Jersey—that rely heavily on high earners and are “heavily exposed” to revenue volatility, Moody’s analysts warned in a March 20 research note (subscription required for full download). Volatility among top earners can be pretty severe: Moody’s estimates the peak-to-trough change in the incomes of millionaire earners ranged was decrease of 42 percent in the comparatively mild 2001 recession to an even steeper fall of 48 percent in the 2007-09 financial crisis. The tax increases enacted by California, Connecticut, New Jersey and New York after 2009 may make it more difficult to raise taxes again if these states face revenue declines. With the 2017 federal tax law change severely limiting state and local tax deductions, the post-2009 tax increases are already more expensive from a taxpayer’s point of view than when they were enacted. The limitation on deducting state and local taxes could heavily temper both resident and political appetite for future state tax increases. New York’s reserves are an exceptionally low 2 percent, not including roughly $4 billion dollars in still-unspent although partially allocated windfall cash from civil penalties imposed on various major banks. Meanwhile, New York is more exposed to those potential 42-48 percent income swings among millionaire earners—which, all by itself, would take down total PIT receipts by nearly 20 percent. New York City is obviously a hugely important part of New York State’s tax base. While the two don’t overlap—the city’s income tax, unlike the state’s, doesn’t touch non-residents—trends in city collections are an important harbinger of state revenues. The IBO report projects the city’s income tax receipts will grow 3.2 percent between fiscal 2020 and 2023. For the same period, the IBO estimates high growth of 4.6 percent from the city’s unincorporated business tax, which also applies to the highest-earning non-resident partners in professional and financial firms doing business in the city. Again, the state’s PIT forecast for 2020 through 2023 is for 5.2 percent annual growth. The IBO also is forecasting much slower growth for both the U.S. and local economies, leading to “a corresponding deceleration in tax revenues over the [five-year] financial plan period.” Including all sources, the IBO’s revenue forecast for 2019 through 2023 is the lowest for any five-year period since the recession. Meanwhile, the yield curve has inverted—i.e., short-term bond rates have jumped higher than long-term rates. In the past, this has often signaled the approach of a market peak followed by a recession. In this case, however, consensus of leading analysts seems to be downplaying a negative interpretation. This much is certain: entering what will soon become America’s longest economic expansion on record, a downturn is inevitable sooner or later. New York State is less well prepared to absorb a recession than at any time since Governor Cuomo’s first term. As the Legislature prepares to pass New York's next state budget, some cracks seem to be appearing in the long-term fiscal foundation.